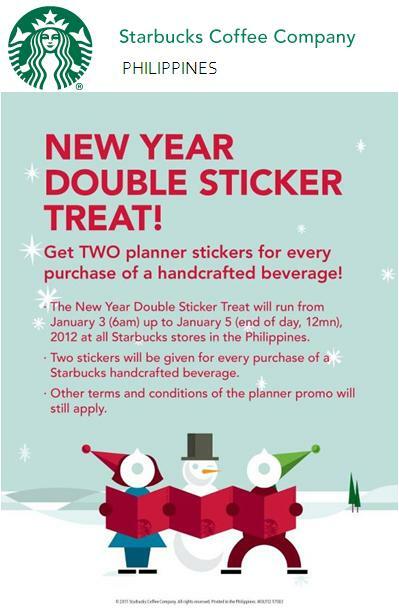 The New Year Double Sticker Treat has been extended until January 13, 2012. Promotion is valid at all Starbucks stores in the Philippines. Two stickers will be given for every purchase of a Starbucks handcrafted beverage. Other terms and conditions of the planner promo will still apply. The other day, I saw my son gave something to his elder sister and last night she told him that the color of the planner that he wants is not available. That something could be the planner claim stub and I am glad the promo was extended. At least, he gets more time to have the planner of his choice.